OpenSSL does not distribute code in binary form. However, you can download it from other websites. 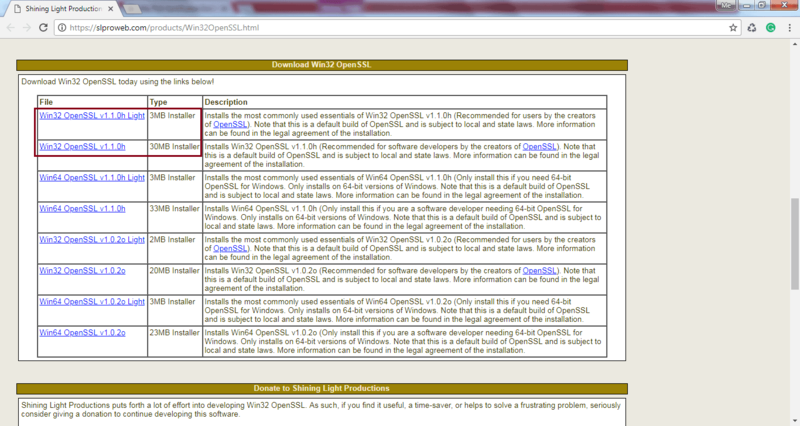 Visit wiki.openssl.org, select and download OpenSSL for your platform. For example, click on the https://slproweb.com/products/Win32OpenSSL.html link to download the installer for Windows. You can download the light or full version, as shown below. Click on the installer and finish the installation wizard. After installation, go to C:\OpenSSL-Win32\bin and double click on openssl.exe to start working with OpenSSL. This will open a command prompt on Windows, as shown below. If you have got certificate files from the CA which are not supported on your web server, then you can convert your certificate files into the format your web server or hosting provider requires using OpenSSL commands. To know about all the commands, apply the help command. To get help on a particular command, use -help after a command. The following are main commands to convert certificate file formats.